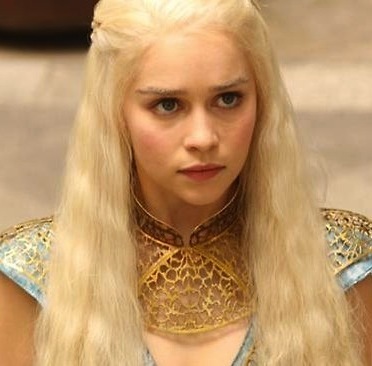 On a scale of 1 to 10, how weird is Khaleesi (Ka-lease-ee) as a name for current and future earth-dwelling beings? Weird or not, it’s happening. According to babynamewizard.com exactly 146 Khaleesis were born in 2012. It’s not exactly the worst Game of Thrones-inspired name. Out of all the characters, Khaleesi — played by Emilia Clarke on the HBO series — and Arya (another newly popular name) are two of the less morally corrupt. Granted Khaleesi, which means “queen” in the fictional language of Dothraki, does eat a horse heart, and her ultimate goal is to see Lannister heads burnt by dragons and put on spikes, but she is mostly kind with good motives. I actually kind of like the name Cersei, and I guess there’d be low expectations. Like if the kid didn’t turn out to be a selfish, husband-murdering brother-f*cking sea hag you’d be proud. Other weird/crappy/bully-worthy names: Skyy (after the vodka), Pippa (Kate Middleton’s big-bootied sis), and Haddie (slightly obscure Parenthood reference).